SaniClean’s SaniWedge ‘Wedge Wire’ Strainer Element; an ideal ‘alternate strainer element’ for many applications! Constructed using triangular shaped wires; consisting of a ‘wrap wire’ which is continuously wrapped around the outside of internal ‘support rods’, forming a cylindrical strainer element. The ‘wrap wire’ is continuously wrapped around the ‘support rods’ with consistent spaces or ‘slot opening’ between the wrap wires resulting in dimensionally consistent ‘slot opening’s the entire length of the strainer element. The triangular shaped ‘wrap wire’ is resistant welded at every point of intersection with the internal ‘support rods’. Available with slot openings down to 50 microns. All material is 316L SS. The SaniWedge ‘Wedge Wire’ strainer element is manufactured to a consistent diameter, with consistent slot openings. SaniWedge ‘Wedge Wire’ is significantly more rugged, durable, and longer lasting than Wire Mesh OverScreens, SKS OverScreens, or Filter Socks; able to withstand 150# collapse pressure differential. SaniWedge ‘Wedge Wire’ is 3A Approved for dairy products if the slot opening is 0.005″ or greater. 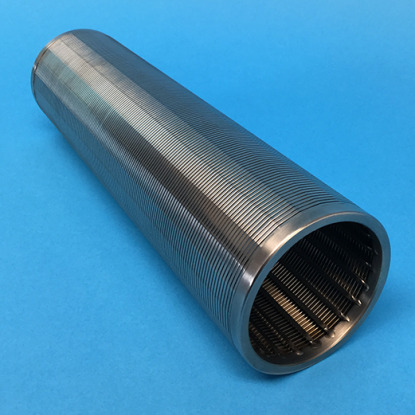 The SaniWedge ‘Wedge Wire’ Strainer element replaces both the Perforated Support Core/Back-Up Tube and the Wire Mesh OverScreen.